Golf Story, an indie, released on the Switch last week, is reminiscent of old Gameboy Advanced games. It has beautiful 32-bit artwork which is animated with a smoothness that makes proper use of the modern hardware. You play as a young man with a technically obtuse, but effective, golf swing who dreams of being a professional golf player. The game’s narrative arc follows the boy as he convinces the folks around him that, despite his odd swing, he can play a good game of golf. While the story isn’t groundbreaking, the overall premise is serviceable and the writing is pretty good. But, the way that the dialogue is presented makes Golf Story give some of the most charming storytelling I’ve experienced this year. In games with no voice acting and even some with bad voice acting, it can be hard for a player to get a good idea of the nuance in the dialogue. This can, often, make the dialogue feel stiff and immovable. Very early on there is a moment in Golf Story, where the main character looks on as he watches a group his peers getting some, incredibly needed, instruction from a character named, Coach. One pink haired woman goes on about how good her swing as she sends a number of golf balls speeding towards everyone unfortunate enough to be on the course. After a short sequence, she swings again and beams Coach right in the head. In the tiniest font, housed inside of a small text box she says, “Fore.” From this small gesture, I was able to hear a change in her voice in my head, as she shrunk like a child getting caught in a lie. 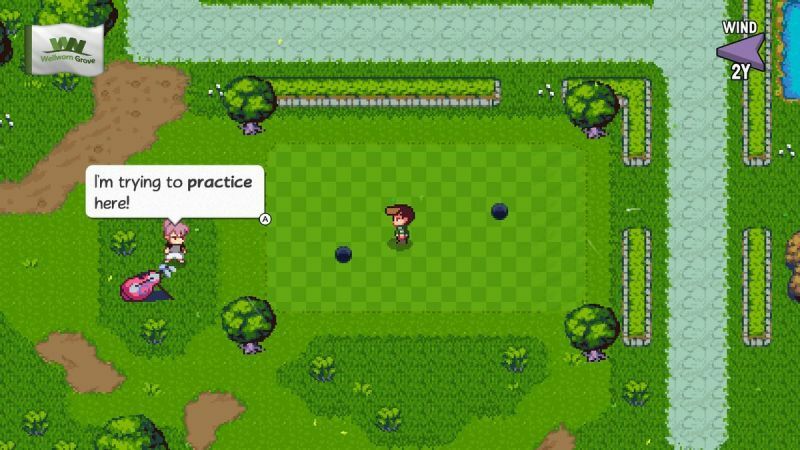 Golf Story manipulates text and text bubbles in ways that end up communicating emotion with a specificity that most games cannot boast. In Golf Story, text isn’t treated as though it is a static thing. When characters are excited a text box could appear the size of the screen with only one word on it, or when they are unsure, the text box tilts slightly after appearing on the screen. In video games it’s actually not that common to see bold and italic font but, Golf Story makes tasteful usage of those tools in order to bring sarcasm and emphasis to life. Often time the most important part of the dialogue is in how the text box appears on the screen. More so than any non-voice acted game, recent memory, Golf Story shows a high level of care towards its diction and I love that about it. All of this is very hard to explain without examples so here is a gameplay video with some of the things I’m talking about. Because of this very thoughtful treatment of words, mixed with good art, good reading, and good gameplay, Golf Story has held my attention and I wouldn’t hesitate to give it a recommendation to anyone looking for a decent RPG.